Are you ready to start building an online store, but you don’t have the capital to spend on a premium WordPress theme? Not to worry, since the internet has plenty of gems to offer in terms of free WordPress eCommerce themes, and many of theme look like something you would have to pay for. It doesn’t matter whether you’re selling t-shirts or a revolutionary new way to feed your dog; these eCommerce themes have the ability to make your customers happy and transfer that happiness into money for you. What Do The Best Themes Offer? The ideal eCommerce themes integrate with tools like WooCommerce and they let you showcase products on the homepage. Not to mention, a responsive layout is essential for ensuring your site is accessible across all devices. You also need to be on the lookout for themes with social media integration, a contact form, and even widgetized layouts because they make setup faster and more intuitive. If you were to setup an eCommerce site on your own, it would take a long time and you’d probably need to bring in expert help. Thanks to the WordPress themes we’re featuring here, however, eCommerce setup can be easy. Thanks to integrations with tools like WooCommerce, you can build an online store quickly, with security built-in, in half the time. Let’s take a look at the best free eCommerce themes currently available for WordPress. 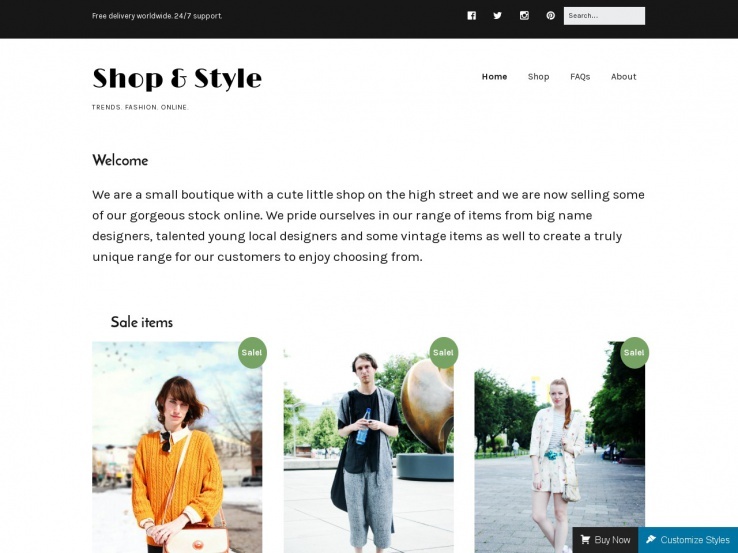 The ShopIsle WordPress theme is all about getting the most out of your online store since it uses clean and elegant elements to present your products in a professional manner, while also improving the amount of conversions that come through your store. As with all of the themes on this list, ShopIsle is completely free. It also integrates with WooCommerce to generate a modern design for your products. The WooCommerce plugin provides the shopping cart and product management tools you need to sell your items and collect the payments. The responsive design is essential in today’s mobile world since more and more people are starting to make their purchases through tablets and phones. In addition to the tools offered for sharing and selling your products, the ShopIsle theme has an easy contact form so your customers can get in touch with you and to provide the best customer service you can offer. Along with that, the theme includes a beautiful About Us page to feature members of your team by using images and descriptions of those people. 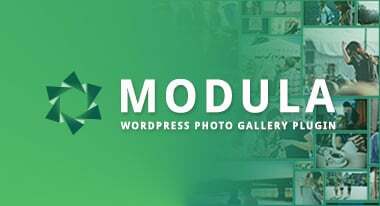 The header modules support high-resolution images and it has a parallax effect for grabbing the attention when users land on your site. The header allows you to add a text overlay and a button to serve as a call to action and drive people to your sales pages or promotional content. The shopping cart icon always sits at the top of the page and the theme includes a blog which is a great way to share valuable tips with your visitors and improve your search engine rankings. Share grid galleries of your latest and featured products and use several widgets to add recent comment lists and top rated products. 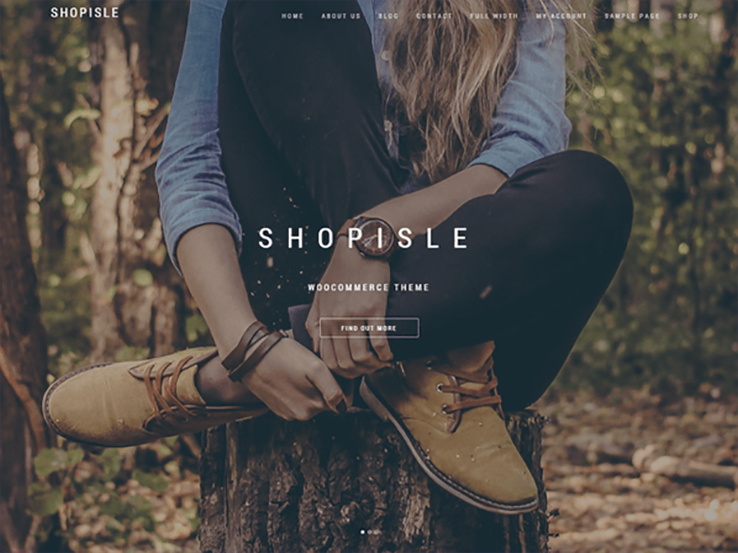 Along with social media buttons, collections, and a spot to upload your logo, the ShopIsle WordPress theme has everything you need to create a successful eCommerce website. 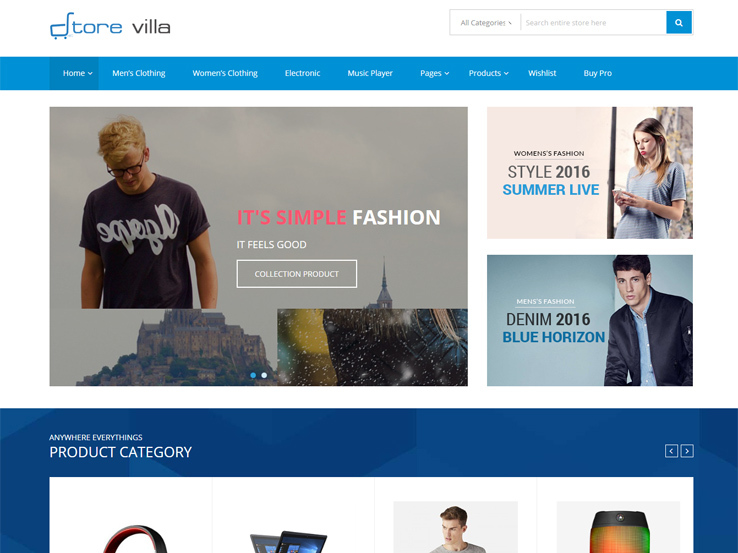 StoreVilla is a quality-rich, free eCommerce WordPress theme based on the WooCommerce plugin and its extensions. It is a feature-rich theme with a beautiful design that is best suited for fashion, digital and jewelry and many other online stores or web shops. This is an awesome eCommerce WordPress theme that comprises almost all the essential features for creating a complete eCommerce website. It also allows you to make changes in your website as per your choice using its cool Customizer tools. 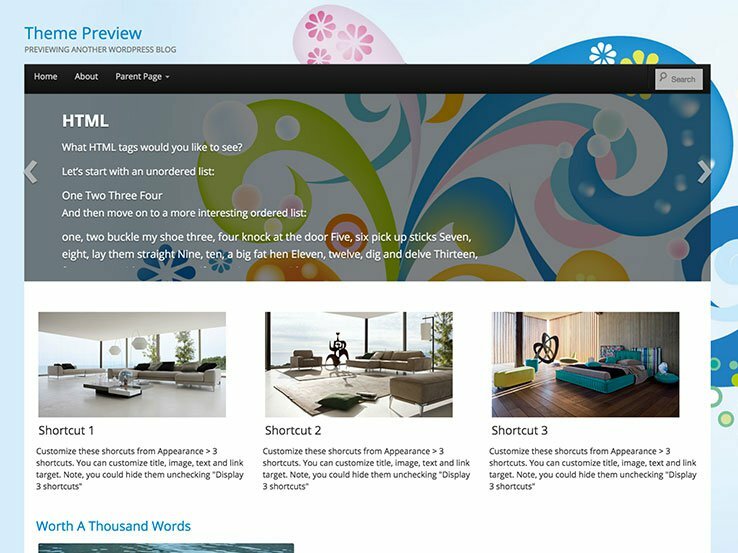 With this theme anybody can craft a perfect website in no time – you don’t need to assign a programmer or developer. 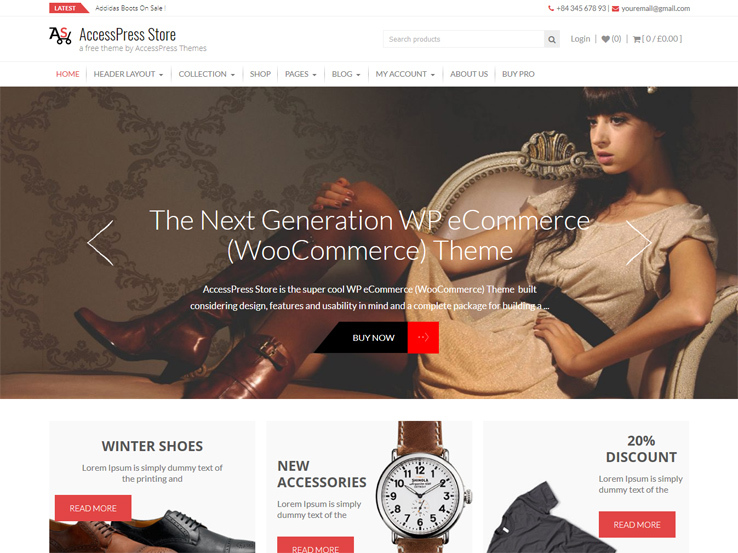 AccessPress Store is a fully-fledged, free WordPress WooCommerce theme that is perfect for all kind eCommerce websites. Deeply integrated with WooCommerce, the theme is a next generation eCommerce theme built with WordPress Live Customizer. It features multiple layouts, custom widgets, color options, a highly configurable homepage section, and much more. The theme allows YouTube video integration right on the homepage, which makes your website more engaging and interesting. It offers multiple category display layouts, product and content search, promo ticker, beautiful product pages, stunning checkout page, and so on. It is a simple and user-friendly theme so that anybody can create a complete online store in no-time. EightStore Lite is an SEO-friendly free WordPress eCommerce theme ideal for creating all types of online stores, like a fashion store, digital store, or an interiors and accessories shop. The theme is fully built with Live Customizer – it allows you to configure settings, designs with live preview. It has a highly customizable homepage – you can enable or disable each homepage section as per your requirement. EightStore Lite allows YouTube video integration on popup banner and display right on the homepage. It comprises multiple category display layouts, product and post search, promo ticker, payment partners, logo, showcase section and much more so you can create an outstanding eCommerce website in no-time. 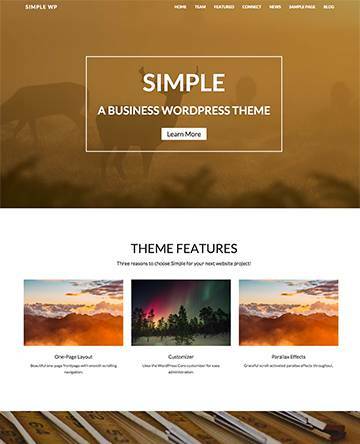 The Klasik WordPress theme doesn’t have the popularity of some of the other themes on this list, but it offers simplicity and professionalism for your online store. Klasik is WooCommerce compatible and designed to help beginner website owners launch a store within a few minutes. You can include a nice slider, thumbnails for your images, features, testimonials, and more on the homepage. The theme comes with six widget areas and 12 custom widget options which makes the design process much easier. The theme is fully responsive and translation-ready which means you can expand your store’s reach to include an international audience. 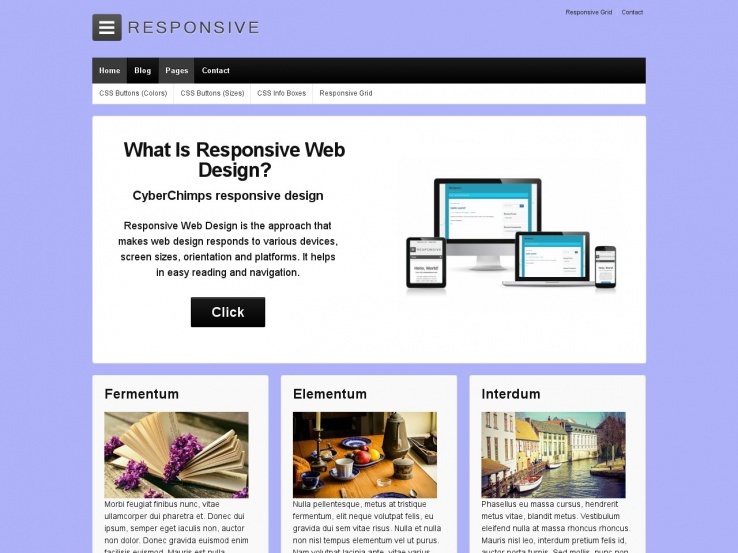 You can’t beat a theme that’s called Responsive because one of the most important features in any WordPress theme is the ability to view the website on multiple devices. The Responsive theme covers that area quite well and it does so by using a flexible grid system which allows your website to look great on all devices. 11 widget areas allow you to easily make customizations and WooCommerce compatibility makes it easy to upload your own products, adjust images, and manage inventory. The theme comes with six template layouts so you can create all the essential pages for your website. The AyoShop theme comes from DesignModo, a company known for high-quality premium themes, so this free theme gives a glimpse of what you can expect from their premium themes. The responsive theme works flawlessly with WooCommerce, but you must remember that it was designed as a child theme for the Genesis Framework. This means that you can be sure your website will be SEO optimized and easy to customize. Anyways, the Ayoshop theme is a non-bloated theme with unlimited color schemes and customization power that comes with Genesis. Translation files are included with the theme and the homepage is just stunning if you check out the demo. The slider is a great way to make a lasting impression on your website visitors and product thumbnails allow you to easily showcase your best-sellers right on the homepage. 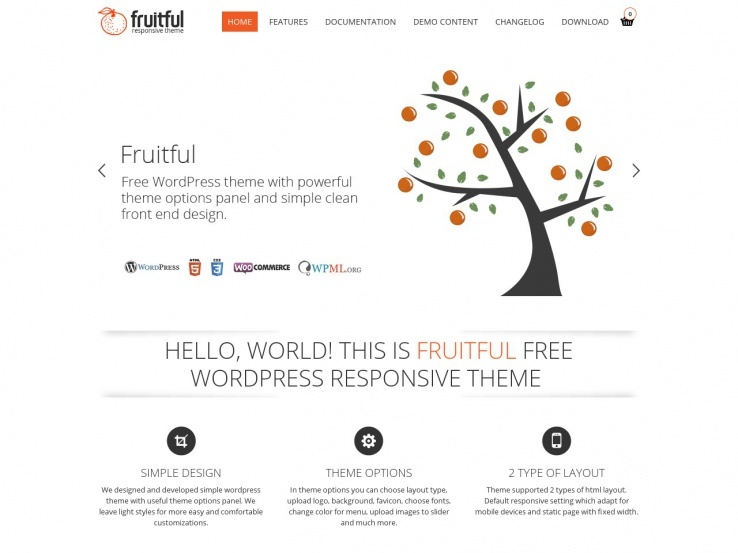 Fruitful is a stunning and responsive theme with stellar WordPress ratings and reviews. The simple and clean frontend design eliminates all the distractions of regular eCommerce sites and the ability to change the styles and designs is always handy in a free theme. Feel free to translate your site into languages like German and Russian. The responsive theme includes features like uploading your own logo, customizing the header, and controlling the position of your menus. On top of that, you can easily integrate your favorite social sites to grow your social media presence. The Make theme is a great choice for anyone who doesn’t like to mess with the code. Although most free themes are pretty good with this, Make takes it a step further with a beautiful drag-and-drop editor. This means you truly need no development experience to get your store up and running. You can use this as a simple portfolio or magazine site but it works even better with the WooCommerce integration. The responsive theme also works well with plugins like Gravity Forms and JetPack which both come in handy when creating an eCommerce website. 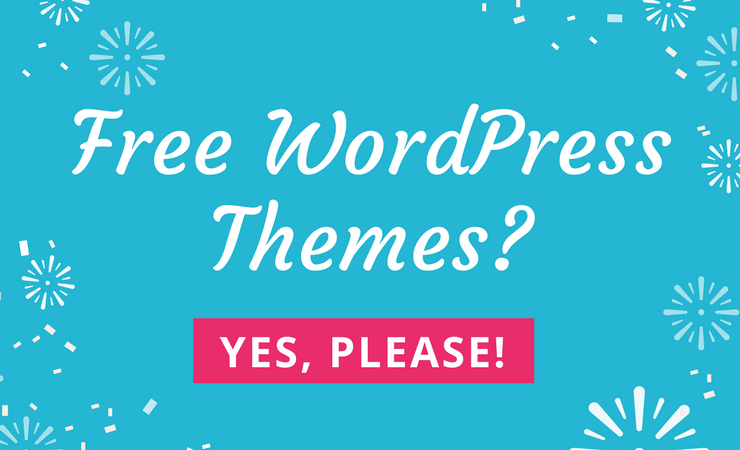 We keep talking about WooCommerce integrating with these themes, so why not share a free theme that comes from the source itself? 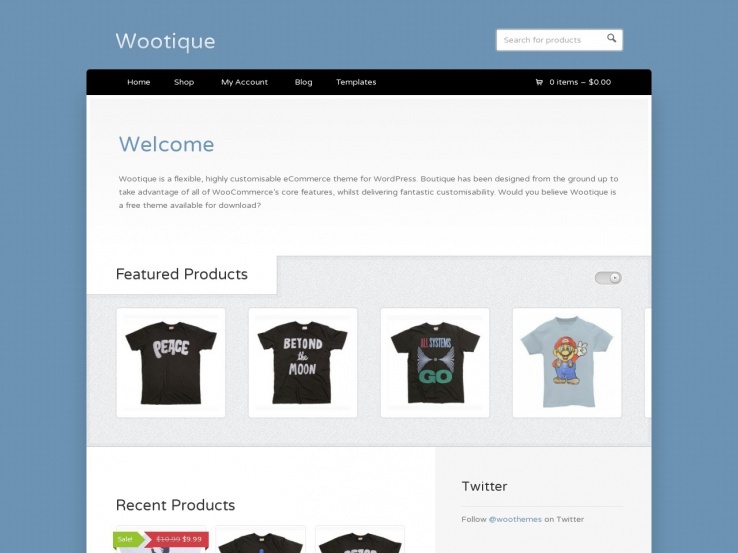 Wootique is a theme designed by the folks over at WooThemes, and it integrates perfectly with their main product, WooCommerce. 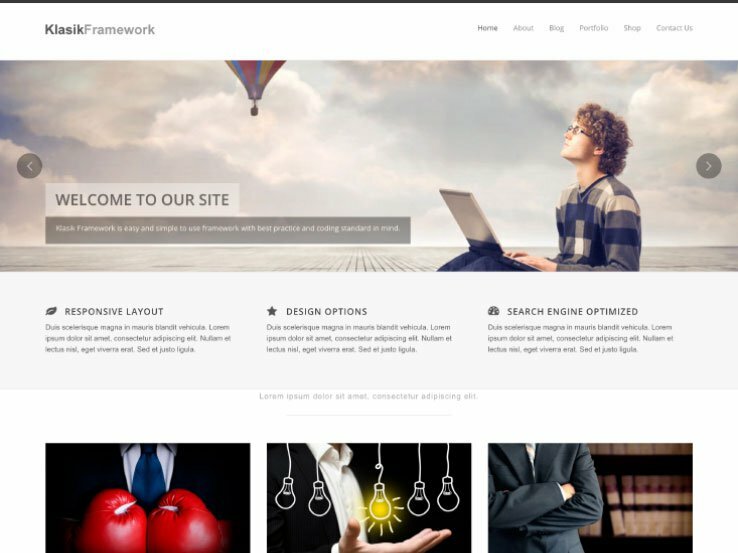 It’s built on the same framework that the company’s premium themes are built on which means your theme will include some quality customization and stability. The theme has a featured slider for showing off your recent promotions and best-selling products. It also comes with various custom widgets, some of which are designed by the WooThemes team. The custom homepage is a notable feature where you can include elements like featured products. The Virtue theme is a free theme from Kadence Themes that really hits home for people who know a little about eCommerce since the theme is focused primarily on featuring different products. The homepage goes directly to thumbnails of the items allowing your visitors to immediately see what you have to offer and eliminating all the distractions. The Virtue theme is extremely clean with tons of options to play around with. The fairly easy to use options panel lets you customize the slider, change the custom fonts, and even completely transform the homepage layout. Once again, this theme is fully integrated with WooCommerce so you have all the tools you need to get started with a powerful online store. The best part is that you don’t have touch a single line of code to do so. The Mystile theme has a sleek design with tons of features packed under the hood. Developed by WooThemes, this theme has a responsive design and the ability to change your color schemes to incorporate your own brand. The custom homepage is perfect for sharing your contact details and presenting your products ina unique fashion. The widget sections allow you to add various content elements without touching a single line of code. On top of that, the theme includes various shortcodes which make the design process easier. The Boot Store WordPress eCommerce theme has plenty of functionality to allow you to create an online store. The free theme comes with two WordPress menus in the header and you can feature any item in your store with the included carousel that shows up on the homepage. The widgetized theme is easy to set up and it allows you to easily feature upsells and cross-sells during the checkout process. 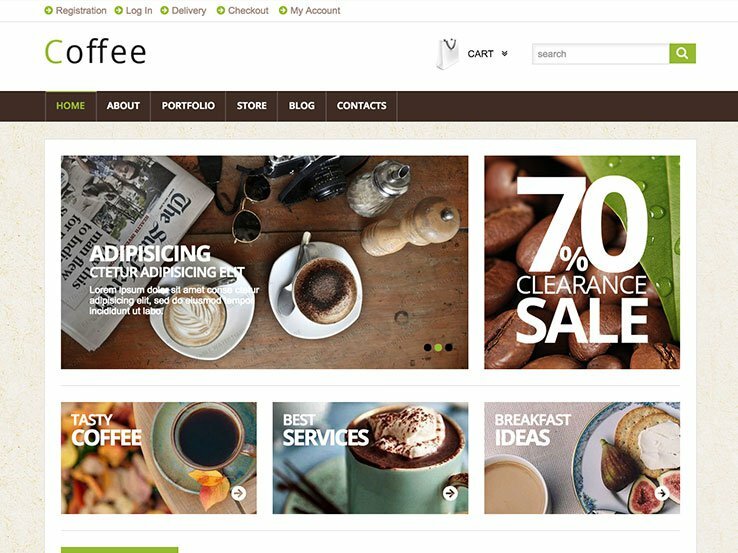 As a niche theme the Coffee Shop is pretty clear on what it’s trying to do; however, the theme customization options allow you to easily adapt it to any type of an eCommerce website. There’s really no comparison to this unique design, with flat tiles that show up on the homepage to highlight the best deals on your store. The responsive theme looks stunning on smartphones and tablets and it integrates fully with WooCommerce. One area that makes this theme stand out is the special module that helps you showcase things like free shipping or special promotions. They can be customized to show up at a certain time which is great for boosting your conversion rates. The Unite WordPress theme is pretty minimal, putting the design control completely into your hands. It’s primarily designed with the wedding industry in mind, but thanks to the WooCommerce integration, you can easily turn it into an online store. The slider is customizable and you can always include additional plugins to add features you need. The shortcodes make your design easier and the Infinite Scroll feature allows you to add plenty of content to your pages without overwhelming your visitors. The Optimizer theme is incredibly easy to set up and customize. 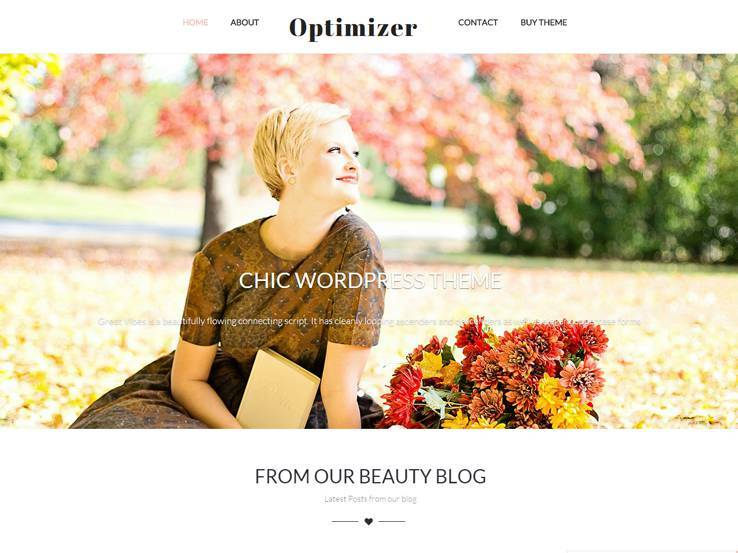 A high-rated theme in the WordPress Theme Directory, the Optimizer has a large header area which allows you to add an image and overlaying call-to-action text. You can also add buttons to drive traffic to your latest promotions or special deals. The easy logo upload is a bonus and over 600 fonts make it easy to customize the typography of your website. Optimizer is an eCommerce theme, fully compatible with WooCommerce. 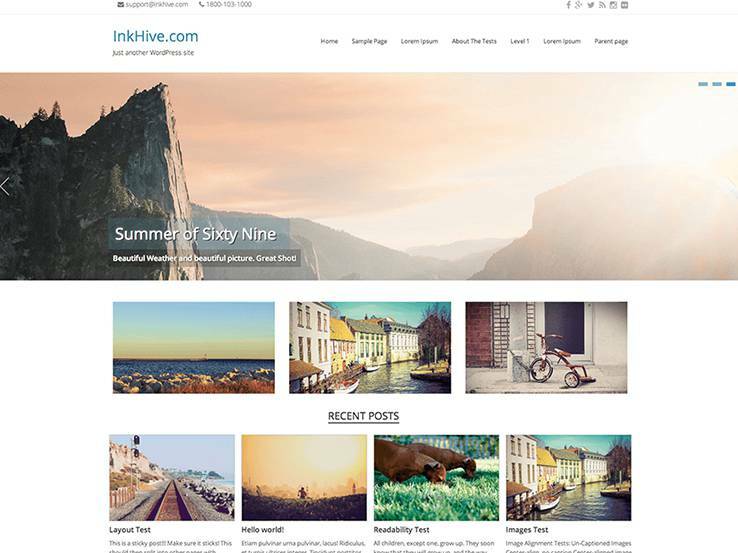 The theme also includes features such as an image slider, MailChimp and Contact Form 7 support, color options, mobile responsive design, and more. 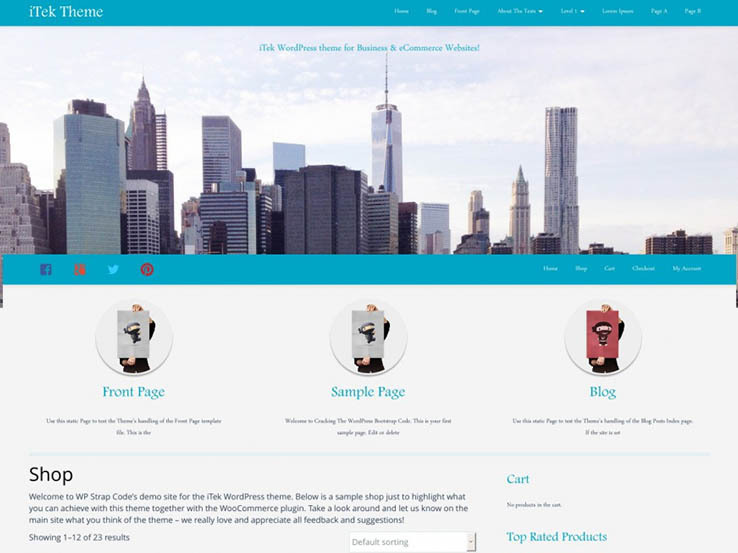 The Store WordPress theme is a wonderful choice for those interested in building an eCommerce website since it includes integrated social media buttons, a minimalist background, eye-catching product preview animations, and a nifty shopping cart feature for your customers. This particular slider has 3D effects and the entire theme is completely responsive. Change the sidebar width for the Store theme, and play around with the advanced menu and navigation system to ensure that your customers always find what they are looking for. Multiple layouts are included with the Store theme and it provides featured product showcase areas, which is ideal for sending visitors to your most popular products. 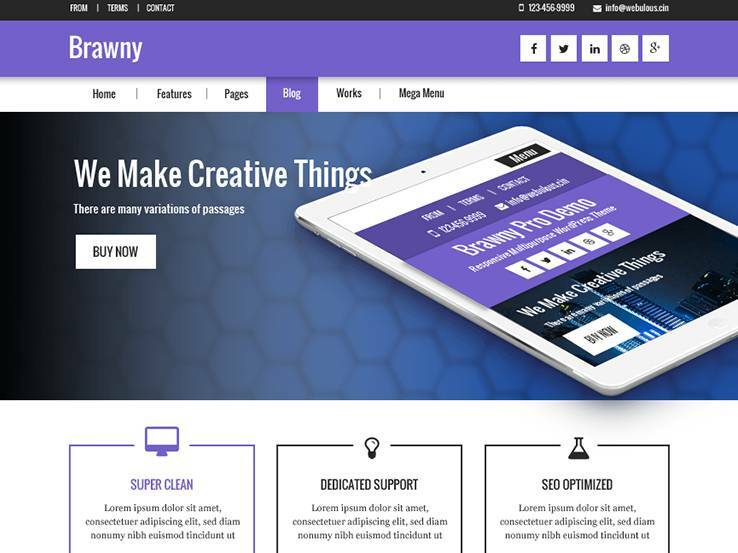 The Brawny theme features bold fonts and vibrant colors. The modern, responsive theme is a beautiful way to start selling items online, with Jigoshop eCommerce integration and sleek social media buttons. The navigation menu is easy to use and quite prominent and the slider/header allows you add beautiful images of your products along with calls to action to drive the attention of your visitors. Don’t forget that the four-widget footer area allows you to add anything from recent posts on your blog to social media buttons, or even something like your most popular products. 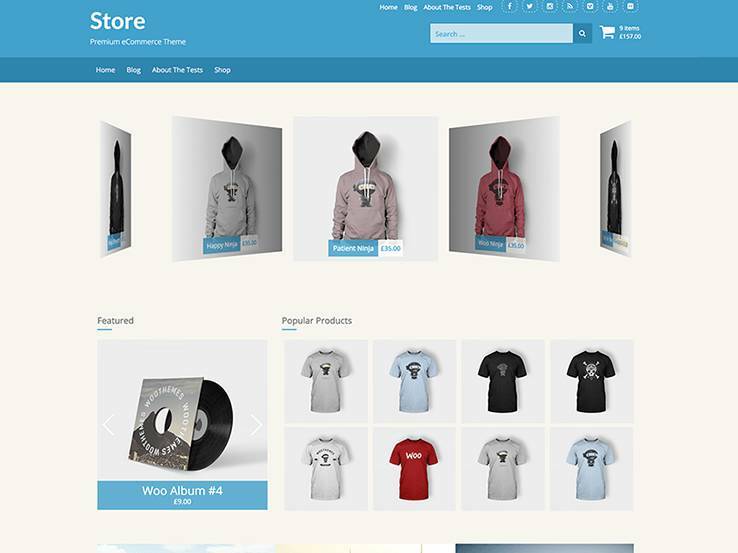 Consider the iTek WordPress theme if you’d like a simple theme for building your store and selling items through the WooCommerce plugin. 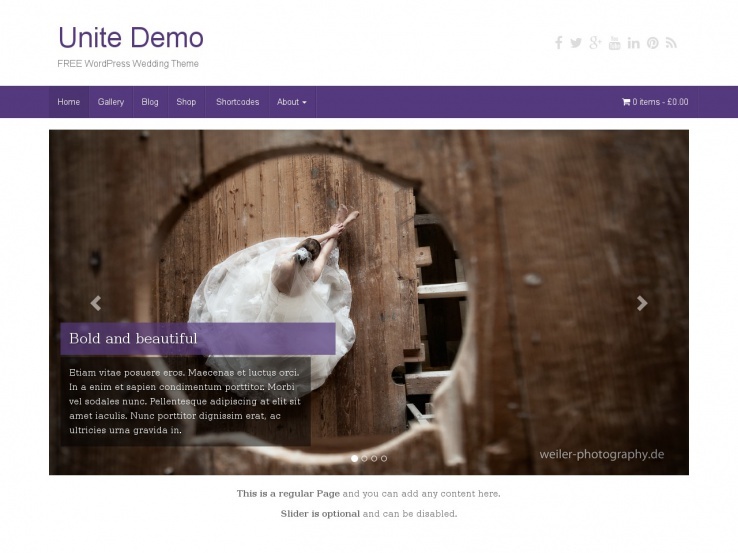 The theme includes a header area where you can upload an image or a slideshow of your most popular products. Add a search bar to make finding products easier and use the widgetized sidebar has options to showcase your recent posts, recent comments, and categories. Take advantage of the blog to share valuable content with your audience and improve your search engine rankings. The iTek theme has an interesting parallax effect that helps draw the attention to some of the media components and you can also modify the colors and backgrounds to match your brand. 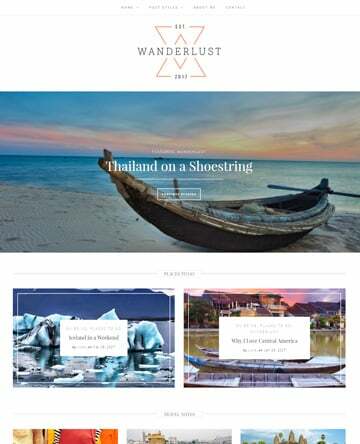 Overall, this theme is a great choice for any small or medium-sized company that wants to create an eCommerce website. 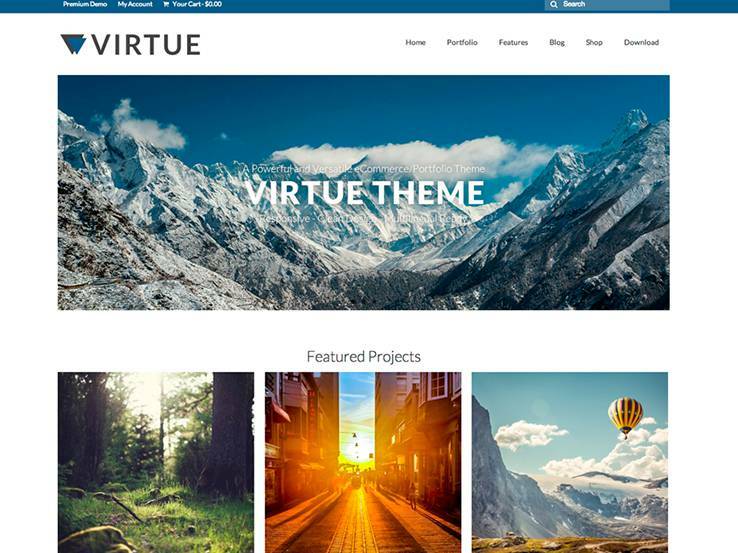 Virtue is a clean, modern and versatile WordPress theme by Kadence themes. 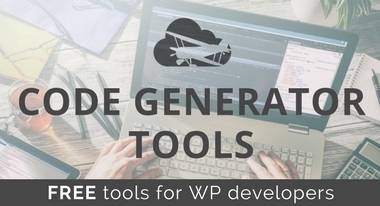 It integrates nicely with the WooCommerce plugin, providing all the tools you need to start selling your products online. The shop layout displays your products in grid style and customers can easily sort through to find the product they want. The slider looks elegant and is great for highlighting your best products, while the responsive design ensures users on mobile devices enjoy a smooth shopping experience. Besides, a blog comes along with the Virtue theme, providing an opportunity to share tips and generate more traffic to your online store. And in terms of customizations, you’ll find a powerful options panel where you can configure the theme to match your style. 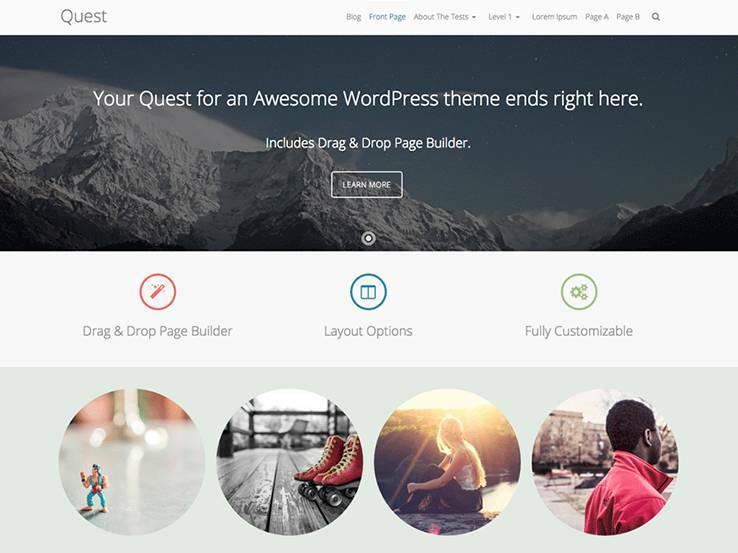 The Quest theme comes with a powerful drag-and-drop page builder that makes it easy to create unique layouts for your online store without touching a single line of code. You can easily create custom layouts and add product sliders and images to make your shop more appealing. The template works well with the WooCommerce plugin, so you gain access to an impressive set of eCommerce features including an intuitive shopping cart, product variations, shipping options, and payment gateways. 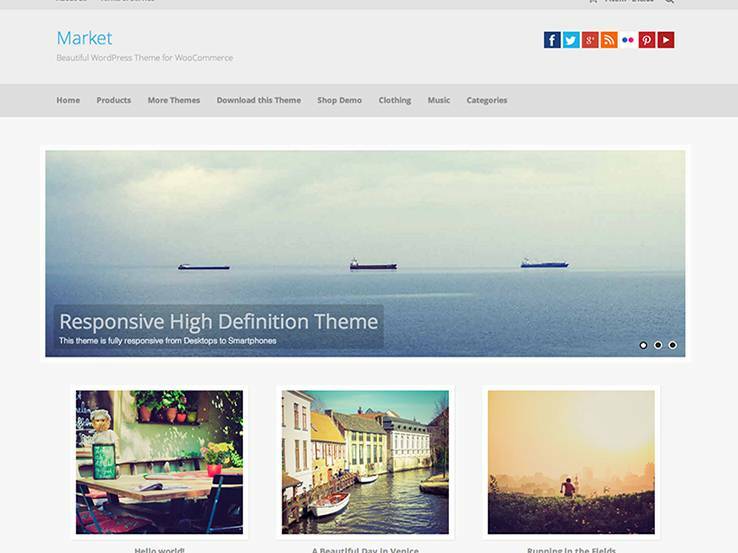 This theme is fully customizable so you can style it according to your requirements. Upload your logo and change backgrounds, colors, and fonts to match your brand. Besides, the Quest theme is built on the Bootstrap framework, which provides for a slick and responsive design that looks beautiful on any type of device. Lastly, the template comes with customer support in case you have any questions along the way. 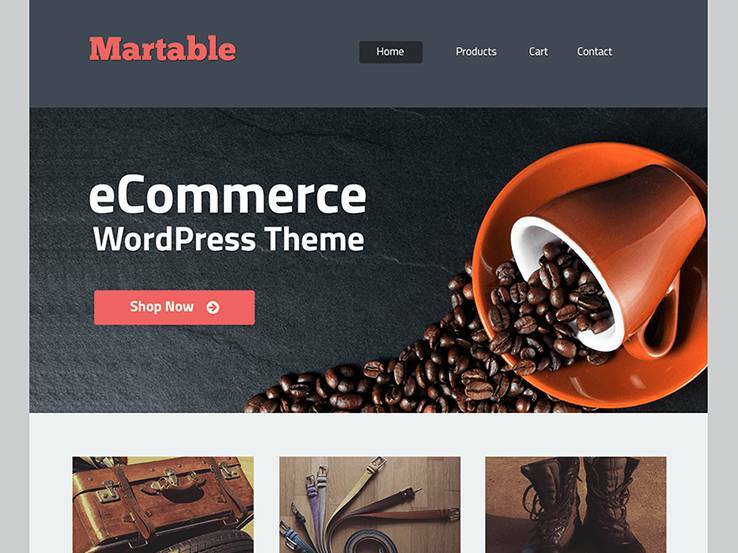 The Martable WordPress theme is powered by the WooCommerce plugin. The homepage features an elegant header that’s great for highlighting your best products and promotions. The header area includes overlaying text and a call to action button to lead people to your product and sales pages. The homepage also includes a welcome section and a featured products section that displays product thumbnails along with descriptions, prices, and “buy now” buttons. The template is fully responsive to cater for shoppers on the go. Besides, you’ll find a blog to share tips and boost your search engine rankings, as well as translation tools that make it easy to display your store in different languages. Also, you can change colors, fonts, backgrounds, and other design elements to match your brand. The Mixed theme comes with a simple and clean design along with a wide range of flexible features. The shopping functionality is powered by the WooCommerce plugin, which provides a shopping cart and handles payments among other eCommerce functions. This template is built on Bootstrap, so your online store will work correctly even on smaller displays. We like that the theme is translation ready as this means you can easily display your store in the language your target market understands. Also, there are lots of customization tools including widgets that allow you to simply drag and drop design elements around your site as well as custom menus, layouts, colors and backgrounds. Want a one-page online store? 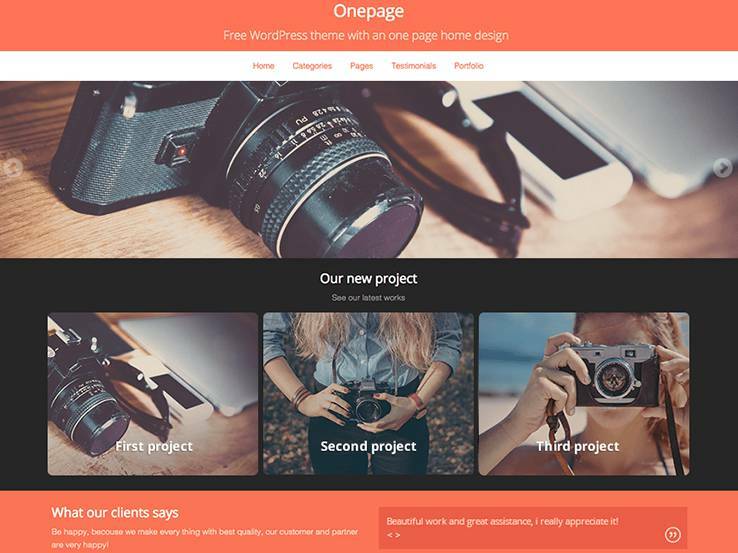 If yes, then consider the OnePage WordPress theme. This clean and flexible theme comes with a well-thought-out design that makes it possible to present your products and other important information on single page. Your customers will love this as it allows them to do their shopping much faster without opening many pages. What if you want a more traditional website? No problem as the OnePage theme comes with the option for a multi-page site. Thanks to WooCommerce integration, you gain access to a wide range of eCommerce features such as shopping carts, product variations, and reviews and testimonials to boost your sales. Moreover, you’ll find a beautiful blog to share tips and generate more traffic from search engines and social media sites. The Pinnacle theme provides a unique and fully responsive layout for your eCommerce site. The main shop page displays your products in an elegant grid style layout and customers can easily filter the products to quickly find what they want. The template is fully compatible with the WooCommerce plugin, which brings lots of eCommerce features such as customer reviews and ratings to increase sales, ability to accept different payment methods, shipping options, product variations and more. Social icons come along with the Pinnacle theme, making it easy for people to spread word about your store on different platforms. To generate more traffic to your online shop and build trust, you can share tips and other information using the blog. Also, you’ll find translation tools so you can target a global market, and lots of customization options to match your style. 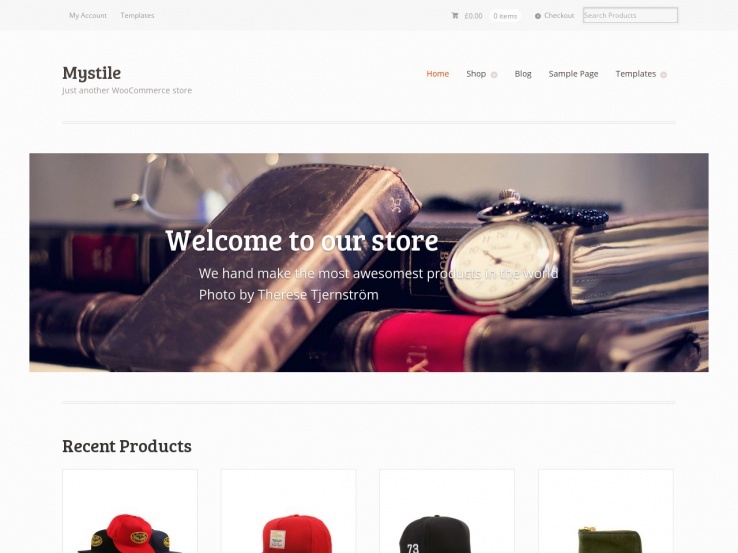 Market is a well designed eCommerce theme from InkHive. 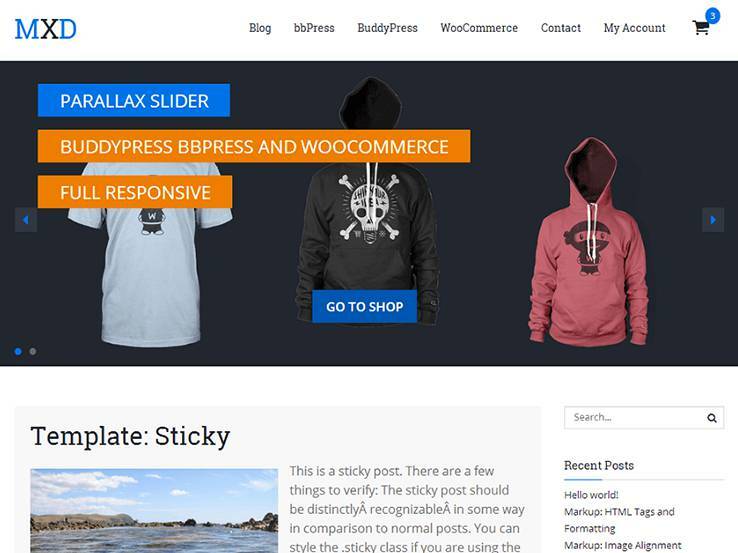 The fully responsive theme is powered by the WooCommerce plugin and brings some amazing features. You’ll find beautiful sliders to highlight your best products, social media links to boost your marketing, custom widgets to easily display your products on the sidebar or footer and much more. Besides, there’s a blog that you can use to boost traffic to your online store. Selling to an international market? No worries as the Market theme comes with translation tools that make it easy to display your website in different languages. In addition, you can easily customize other aspects of the theme to match your style – upload your logo and change the background, fonts, colors, layouts, and more. 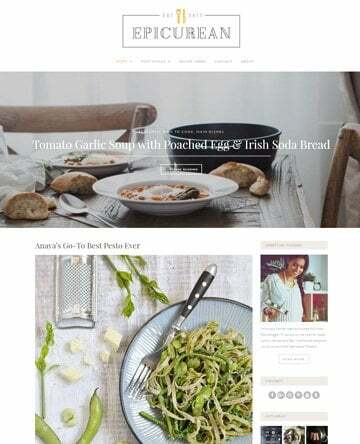 The Seller WordPress theme is professionally designed, easy to use, and fully responsive to cater for shoppers on mobile devices. It has an attractive header design and featured areas, which are great for highlighting your most important products or services. We like the reviews and ratings functionality, which is a powerful way to add social proof and boost your credibility. Besides, you can share tips using the blog to build trust and increase traffic to your website. In terms of customizations, the Seller theme integrates nicely with the WordPress customizer, allowing you to see live previews of the changes you make to your store. You can upload your logo, change fonts, colors and more without touching code. Lastly, this template is translation ready and SEO friendly to ensure your website ranks well in search engines. 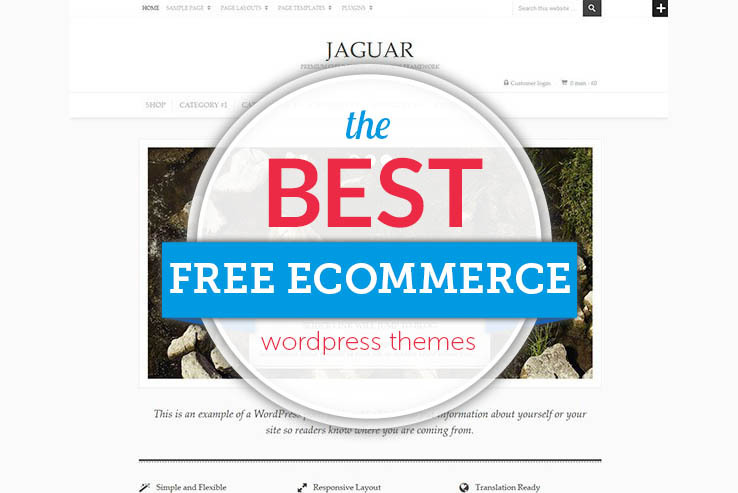 That’s it for the top free eCommerce WordPress themes. Share your thoughts in the comments section if you have used any of these themes to sell your own items online. What would you say are the ideal features to have in an eCommerce theme? If you are new to eCommerce and have any questions, drop a line below. You produced a quality theme! We are happy to include it. I have been shared a WordPress theme about kid fashion by a friend and I think it’s bright & clean, so I want to suggest for you. Thanks for sharing this theme with our readers. 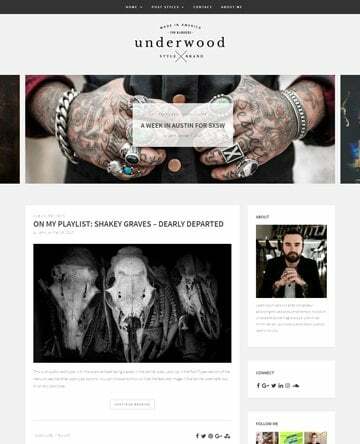 Another Woocommerce WP theme for florist, accessories or jewelry. I think it should be appreciative. Amour looks like an impressive theme, and we will add it to our list for a feature update. Hi Priya,\n I agree, Pinnacle is a very impressive theme with a modern flat design with multiple functions. Thanks for the feedback! 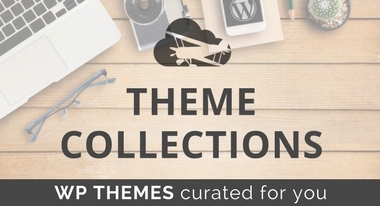 Your themes listing is very helpful to any new business startup. Keep sharing this kind of stuff.